Below are products that we have made in the past. We could make a need, however, generally we need large runs, 1000+ and potentially a setup fee. If any of these are of interest to you please contact us and we can quote. Note this is not a stock item. 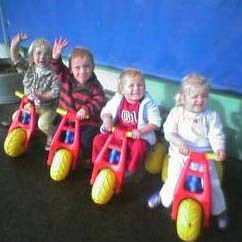 The famous great Kiwi ride on toy is also sold assembled. In these convenience demanding times we are selling more of these buggys. Kiwi Icon Toy. All kids should have one of these in the bath. Squeeze the boat: toot toot. Bat and ball same as 2015. Excellent value for money for the backyard or the beach. sold in a plastic bag. Various colours. Wicket, Ball and Bat can be sold separately. Economical plastic soccer ball. You won't cry if it gets washed out to sea. Child's beach or sand pit spade, bucket and sieve packaged together as a turtle. A very cool retrol product from our back catlogue of historical and antique plastic toys. Economical plastic rugby ball. You won't cry if it gets washed out to sea. x 3cm at grip (diameter). We do have limited stock at the moment. The old Electra is still in service around the world. The RNZAF operate 6 Orion Maritime Surveillance aircraft (converted Electra). Read More. Ideal as gift containing a few chocolates and the like or for dentists and parents for their children's milk teeth. Ideal for the kitchen or the office. Containers slide out like draws, handy tray on top. Sold in box, requires easy assembly. Note this is a product from our back catalogue, this is not a stock item. Trays can and baskets can be sold separately. See below. Height 31cm (top of handgrips), 25cm to the top of the back (seat). Wow. Check out this old product from EPI Plastics, bought to you by the people that made the famous "Dune Buggy" ride on trike. Made in New Zealand. Made from heavy duty plastic (HDPE) with strong 6mm diameter steel axles. Built to last in good Kiwi style. Fully guaranteed and because it is built in NZ spare parts are available. After inital trials, we would like to make some adjustment to the wheel postion to make them more stable. Let us know if you're interested. Microwave safe. Calibrated measurements on inside. Solid and high quality. EPI has restored this old toy mould. While this is a back catalogue item we do have some stock. Note a stock item. Made to order, minimum order quantities apply. Note a stock item. Made to order, minimum order quantities apply. We do have limited stock available in a variety of colour at the moment. Note this is not a stock item. In our back catalogue. We can run this but would need an order of 1000+. Please contact us. Our latest product release is a new wheel. EPI is currently developing a large number of wheels for various clients. 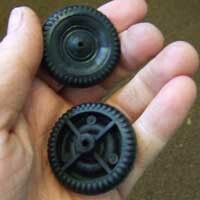 Small polyprop wheels - made from Plunket Baby Seats and other recycled plastics.